The oak leaves in the picture are compressed flat for shipping so you get more than it looks. The Oak is a tree wide spread across most of Europe and famed for is size and strength. This can be its downfall as through the ages the great oak was cut down and used to build houses and boats, now days it is not as common a tree as it used to be which means it can be difficult to find large trees with big leaves for our shrimp food. 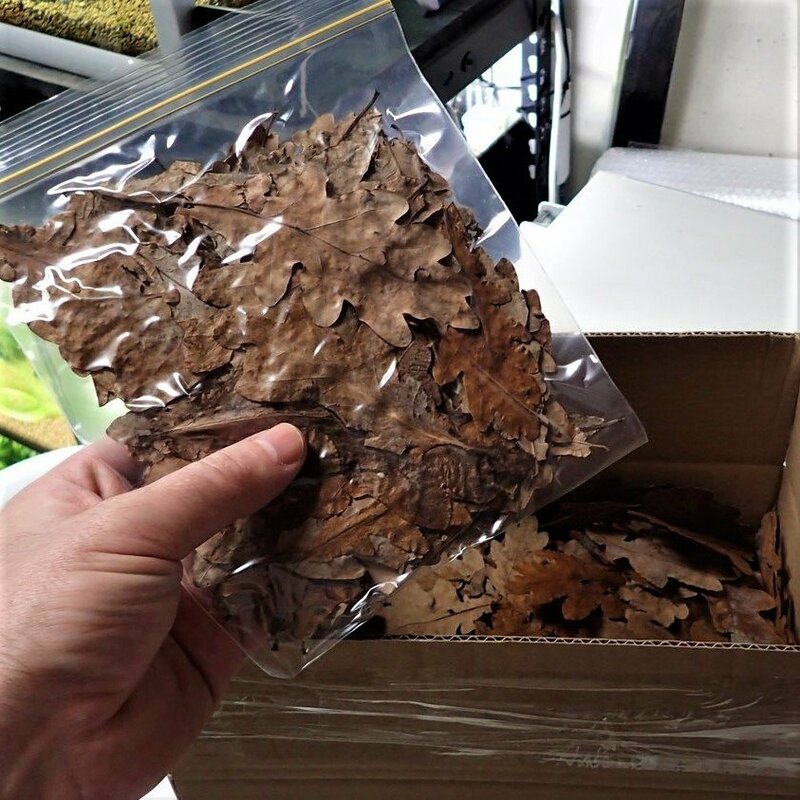 These Hand picked Oak leaves (fall 2018) were picked before the winter from an area far from traffic and Cities on common land where no pesticides had ever been used. It's important that you know that leaves in general should be picked before the winter so that they are not to washed out and decayed for our shrimp tanks. These leaves have been dried and flattened over a period of 4 months. Oak leaves in my opinion are better than Indian Almond leaves in that they don't produce so much tannin's in the water..while tannin's are beneficial I personally do not like brown water in the tanks. As a shrimp food the shrimp will graze the decaying oak leave and eat all the bacteria and fungus that forms on the leave until nothing is left of the food. When do I need to replace the oak leaves ? The answer is never, the shrimp will eat the oak leave as a shrimp food source until nothing is left at all, I like to add a few new leaves halfway through the leaf decomposition. Why use leaves in a Shrimp Tank ? In the wild shrimp have evolved to live of decaying matter such as wood and fallen branches this includes leaves.